A Non-Profit Organization, "Ar" in Kyoto, has been developing the support system of handmade censor-switches for severely disabled people with communication difficulties. In order for severely disabled people or patients with incurable disease who lost almost all mobility of their bodies to communicate with other people, it is necessary to make the censor-switch which can detect a slight movement of each patient's most available muscle, such as eyelid or finger tips, and connect the switch to computer softwares or communication-support facilities. In case of ALS (Amyotrophic Lateral Sclerosis) patients, some censors that detect patient's blink or slight movement of cheek muscle have been used as switches. Each censor-switch needs to be adjusted for each patient's situation: they need to find which part of muscle movement can be most available for each patient because it varies according to the patient's condition. Mistakes in wiring can lead to unnecessary deaths. However, there has been no specialist or public support to find the most mobile part of the body and make the most effective censor-switch for each user. Yamamoto, Shinsuke and Hasegawa, Yui are both students of the Graduate School of Core Ethics & Frontier Sciences at Ritsumeikan University. They have been working in "Aru" since 2007, and helped Nishimura, Yasunao (ex-enginner) and Hisazumi, Junji, who have worked for supporting for censor-switches for ALS patients as volunteers at Kinki region of Japan ALS Association. The students have learned how to make and adjust censor-switches, and tried to improve the usage for patients living at home in Kyoto Prefecture. 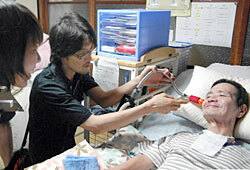 Kyoto Prefecture Incurable Disease Support Center has also contacted them and asked for their support. Censor-switches are made by using cheap materials, such as plastic tubes for gold fish or remote controller of game sets. Yamamoto said, "It is difficult to make the most suitable switch which does not disturb the daily movement or care of each ALS patient. Still, I would like to let more patients know that they can communicate and enjoy their lives better by using the censor-switch and computer." The Seminar for support of communication of patients with incurable diseases is held at Ritumeikan University on August 1 and 2, 2009 with subsidy from NEC. Admission fee is 500 yen. Thoese who are interested are asked to contact Sakura kai through 03-3383-1337.